In a most evaporated form you know. 'Twas in the most compressed and concentrated form. We'd evaporated taters; O, they're the chest inflators! Even to the milk of an evaporated cow. One tends to think of the impact of the Klondike gold-rush in terms of a sudden discovery of the Yukon by the world at large, and of the development of that territory at the hands of the thousands who flowed north to the goldfields. Even realizing that over $100 million worth of gold was taken from those creeks in the first 10 years after the strike on Bonanza Creek, it is difficult to calculate the impact of the widespread economic boom triggered by the rush. Where did the money go? This is to be a discussion of one segment of the total bonanza; that is, of the share of the wealth which was staked from the beginning by suppliers and outfitters across the continent, specifically by those on the west coast. They went nowhere near the goldfields nor, in all probability, did they want to. The combined factors of short supplies and exorbitant prices necessitated the purchase of at least a year's supplies before one entered that forbidding country. On this basis, many a harbour wholesale dealer made his fortune. 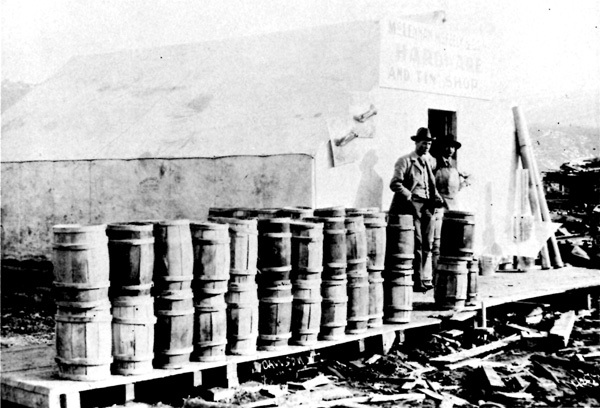 Examination of the workings of this lucrative supply trade serves to introduce the types of commodities which were initially shipped or carried to Dawson. Once recognized, certain types of goods and specific brands can be traced through many years of the Dawson retail trade. Some, like Borden's "Eagle Brand" milk, were North American favourites even before the rush. Others, like Lamont's crystallized eggs and Agen's tinned butter, while not specifically developed for the north, were popular for their suitability for such Yukon conditions as temperature extremes and extensive periods in transit and storage. A look at the geographical and economic structure of the general outfitting trade brings to the fore those cities whose locations and existing mechanisms for supplying the frontier served them well in the business of outfitting the northbound hordes of gold seekers. Of these cities Seattle is a fine example, especially since its active Chamber of Commerce lost no time in mounting a highly effective publicity campaign in order to promote its superior facilities. Nor did it suffer from the prevailing misconception that the new goldfields were in American territory. Here was one group whose optimistic belief in the permanency of Klondike wealth proved accurate, for its members realized that once secured, a profitable segment of the outfitting trade was the thin edge of the wedge. By the 1890s distributors knew enough of the techniques of marketing brand-name goods to realize that those brands which established themselves early in a newly opened community could lead to a market as permanent as the community itself. The largest proportion of goods sold in the outfitting centres was not, in the early stages of the rush, directly intended for any Yukon merchant's shelves, although it seems probable that large quantities of goods were purchased with resale in mind. No matter what his or her intended activities at the goldfields might be, every Klondike-bound fortune hunter would need an outfit  a year's supply of everything that one person or party would need to survive. The idea was hardly new to the North American frontier, for 19th-century gold strikes in California, British Columbia and the Canadian northwest as well as activities in logging, fur trading and exploring, had given rise to equipped and knowledgeable groups of traders. It was their business to outfit a man with due consideration to quality of goods, durability in extreme climatic conditions, compactness and weight. All this was based on the general estimate of 1,800 pounds of goods (or its equivalent) per person per year. Of the many published guides which included outfit lists, very few offered the tenderfoot Klondiker any sort of manual which might give him proper advice on nutrition and on the efficient use of this necessarily compact outfit. There were four which did: William Ogilvie's excellent Klondike Official Guide, which was just that; A.E. Ironmonger Sola's Klondike: Truth and Facts of the New El Dorado, the Chicago Records book for goldseekers, and E. Jerome Dyer's The Routes and Mineral Resources of North Western Canada, published for the London Chamber of Mines. A second source of instructive information, and of course a less reliable one, was the advertisement which appeared in some guides, including Ogilvie's, the Alaska Commercial Company's and Charles Lugrin's Yukon Gold Fields, published by the Victoria Colonist. The foodstuffs were unquestionably the most important element of any outfit, though they were unfortunately the bulkiest and heaviest as well. Although experienced firms packed outfits in portable units not larger than 50 pounds (see Appendix L), the fact remained that a single man could be expected to use up 500 pounds of flour and other grains in a year. Other heavy items were the 150 pounds of bacon, 100 pounds of beans and anywhere from 25 to 100 pounds of sugar.3 The heaviest individual elements of the edibles were the fruits and vegetables. By virtue of their weight and perishability, they were frequently excluded from outfits, an omission which had calamitous results. Scurvy was the traditional enemy of the badly supplied miner in the north. The food industry  packing, processing and preserving  went through a period of experimentation which was characteristic of the 19th century. One wonders if the throng of outfitted goldseekers would have been a possibility had the Klondike's resources been discovered a century earlier. Indeed the two processes most relied on in providing a grocery outfit for the Klondike were new to the 19th century. Foods were first successfully canned during the Napoleonic Wars, and condensation received its impetus from the American Civil War. By 1897 both methods had been taken over by efficient, mass-producing industries. 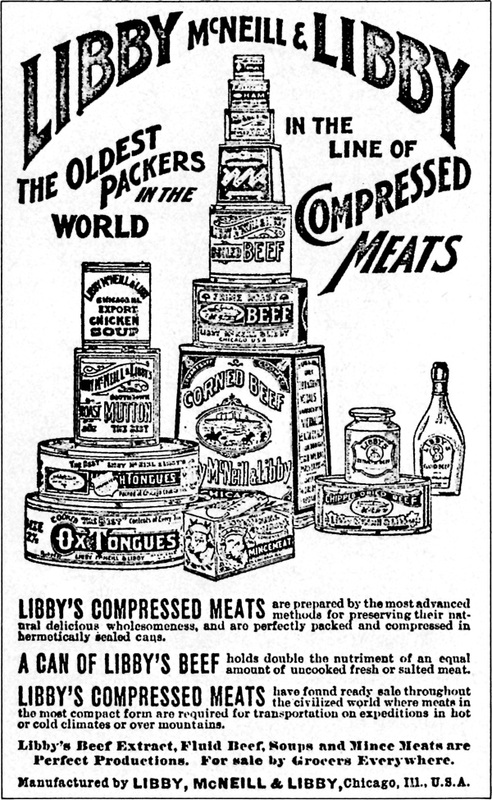 One of the major disadvantages associated with packing tinned products on expeditions was their weight. Gail Borden, an inquiring American schoolteacher and surveyor, became interested in the dual problems of bulky and perishable foods. His experiments were directed toward obtaining from a food its concentrated extract. One of the first practical results of his work was his meat biscuit, a concentrated mixture of wheat flour and beef. "Dry, inodorous, flat and brittle,"9 the meat biscuit was perfectly suited to an expeditionary outfit. Coinciding as it did with the California gold-rush of 1849, Borden's discovery sold briskly. Basically his biscuit was not unlike the traditional pemmican. Other dairy products underwent similar adaptation for use on expeditions. Vacuum-packed tinned butter never lost the early popularity it had gained in Dawson. Packed so that it did not touch the tin (presumably by using paper liners) this butter was reputed to withstand the most extreme climatic conditions. 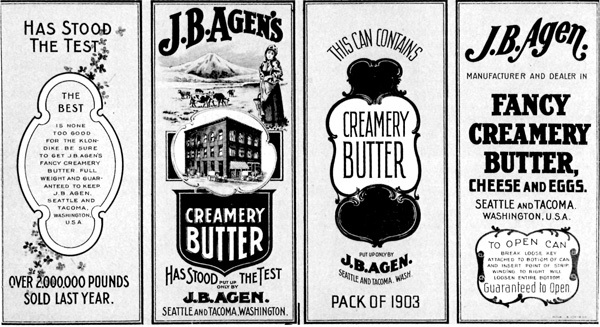 J.B. Agens of Seattle and Tacoma held a long-lasting monopoly in canned butter at the goldfields (Fig. 4). 4 Agen's butter label, pack of 1903. Whole eggs were useless in an outfit for obvious reasons. To this problem the crystallized or powdered egg was the answer. Lamont's crystallized eggs captured the Dawson market by advertising, "No breaking. No Bad Eggs. No shells. No waste. "12 Lamont had reduced the equivalent of two dozen eggs to an eight-ounce can; to reconstitute one whole egg one needed only to add 1-1/4 tablespoons of baking powder and 2 tablespoons water or milk. The process of concentration was not limited to dairy products. Meat, fruit and vegetables could be reduced to a fraction of their original weight, thereby both lightening the load and preserving the food. Bovril was by far the best-known company engaged in reducing meats and, to a lesser extent, vegetables. "Our object is to supply the maximum amount of nourishment in the minimum of bulk. "13 With vast experience behind it, having outfitted prospectors, explorers, surveyors and troops in the far reaches of the empire, the company was up to this latest challenge. 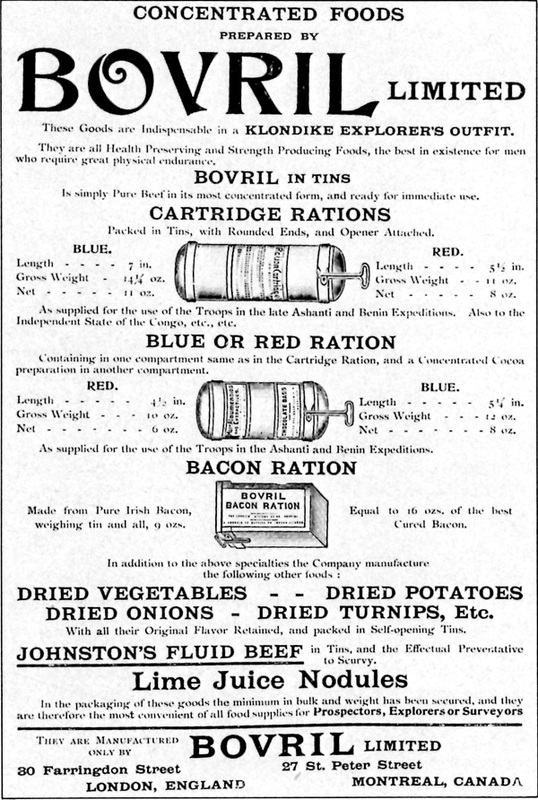 Numerous combinations of beef, bacon, cocoa and vegetables in various reduced "cartridge" rations were available (Fig. 5). 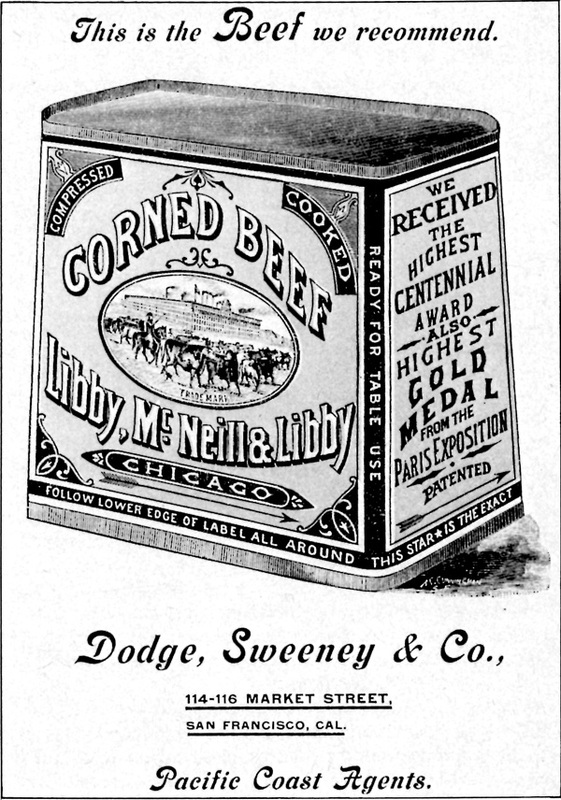 8 Corned Beef, advertised by the Alaska Commercial Company, 1898. (Alaska Commercial Company, To the Klondike Gold Fields, and Other Points of Interest in Alaska [San Francisco: 1898], n.p. 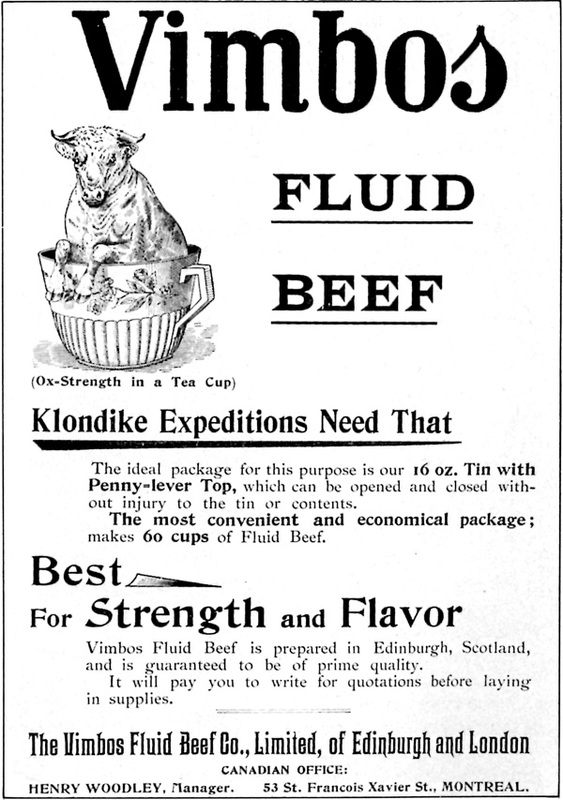 Evaporated, or simply dried, fruits and vegetables were perfectly suited to the Klondike situation. No outfit was complete without about 100 pounds of fruits and vegetables in this form. Advertisements of the period lead one to believe that there was not a fruit known to man which was not evaporated and packed for sale to the Klondike-bound. Potatoes, sliced and dried, were especially popular. "Lubeck" was a brand of dried potatoes which sold consistently in Dawson, but it is not known whether it was produced initially for the outfit trade or not. From the point of view of a world accustomed to frozen foods and chemical additives, the number of processes in use at the end of the century to reduce and preserve foods  all in the name of lightness and durability  is surprising. The prospector's diet was not simply canned; it was evaporated, concentrated, dessicated, compressed, liquified, crystallized and granulated. His beef and sugar (not to mention his lemons, limes, celery and milk) might come in tablets; his coffee and tea in lozenges, his cocoa in cakes. One extremist managed to put together an outfit made up exclusively of such drastically reduced foods as these which, when complete, weighed a mere 69-1/2 pounds.15 In describing this quintessence of gastronomic delight, the author of the publication reported with a remarkable evenness of tone: "Almost everything comes in a powder or a paste, and needs nothing but boiling water and an appetite to make a meal. "16 It is easy to imagine the monotony of food in the cabins and on the trail. No doubt the least concentrated and most appetizing goods were consumed first. For the last months in the season, the remaining evaporated delicacies must have exhibited a dreary sameness. Whether the contents were whole, canned or dried, the trend toward the use of brand-name food products was a significant one. In an age of abundance and expansion in the food processing and packing industry, adulteration had become an established practice. Since there was still little effective legislation enforcing inspection and other controls in either the United States or Canada,17 those brands which guaranteed the purity of their products in their advertising gained respectability in the market. The AC Company, in its promotional Klondike pamphlet, included testimonials from no less an authority than Jack McQuesten for brands considered trustworthy over the years. His support of Eagle Brand milk is indicative of the general trust put in known varieties. A similar endorsement was given to "Royal" baking powder, the only kind (according to the AC Company) which would with stand climatic conditions "harsher against baking powder than against anything else." 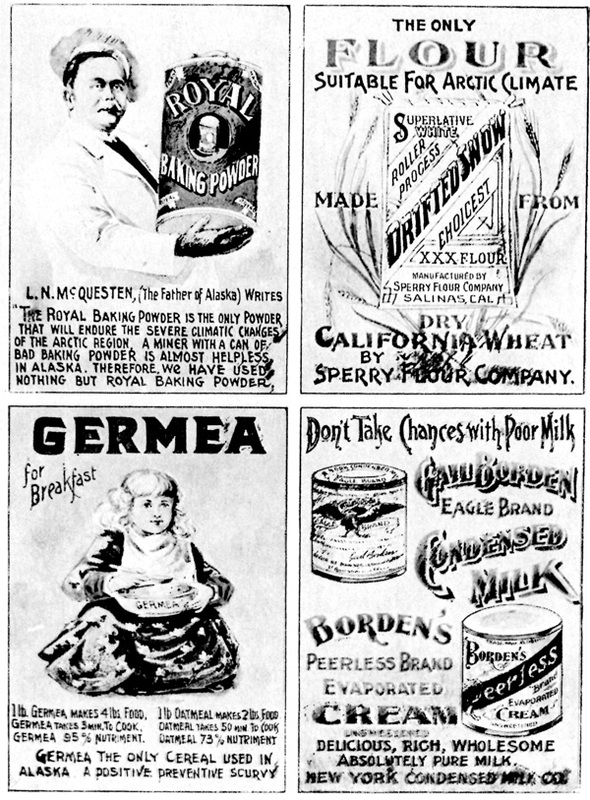 Other brands singled out for commendation were "Germea" breakfast cereal (highly concentrated and nutritive, quick-cooking and a preventative of scurvy), Sperry's "Drifted Snow" flour (for its dryness) and Baker's cocoa and chocolate (withstanding extreme conditions, and also preventing scurvy) (Fig. 9). An additional worry for the miner was that not every company which put up medicine boxes with their supplies could be trusted to fulfill the task knowledgeably or honestly. Her discovery that certain drugs were missing from her medicine chest drove one Klondike-bound traveller to write angrily that "merchants seem to think that when they outfit you for the Klondike thay can put upon you all the stuff that no one else will take and that they will never hear from you again. "24 Given the suddenness of the Klondike phenomenon, the customers' general eagerness and their ignorance, both of their needs and of their suppliers, dishonesty must have been fairly common among the less scrupulous merchants in the trade. The number of reported grievances, even in private papers, is surprisingly low. The food discussed above made up the basic provisions outfit taken by the wise miner. There were those, of course, whose tastes ran to such portable treats as cake and cookies, pickles, spices, cheese and jellies. Like the treasured tobacco supply, these delicacies were probably consumed before Dawson came into view.25 Such luxuries did have an additional value; they could be used for purposes of barter along the trail. While the intelligent traveller knew that it was sheer folly to weight one's pack more than was absolutely necessary with these extra pots and jars, one with a certain enterprising spirit looked at the situation in a different light. He was almost sure to meet some fellow gold-seeker, desperate in his deprivation, who was willing to pay almost anything for a plug of "Old Chum" or a tin of "Log Cabin" maple syrup. In the line of clothing, one comes across general types of garments offered by most outfitters rather than specific brand names. The most important items were heavy lined suits of mackinaw (a blanket-like wool, either grey or plaid), wool, tweed, serge, corduroy, khaki or waterproofed cotton duck. Under this went heavy sweaters, woollen socks and knit underwear. 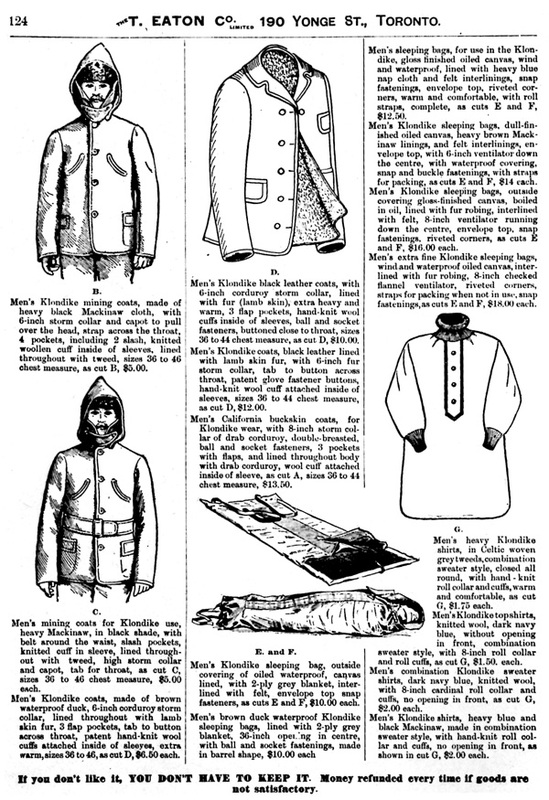 The most descriptive selection of Klondike clothing was offered by the T. Eaton Company in a special Klondike section of their fall and winter catalogue for 1898 (see Fig. 10). 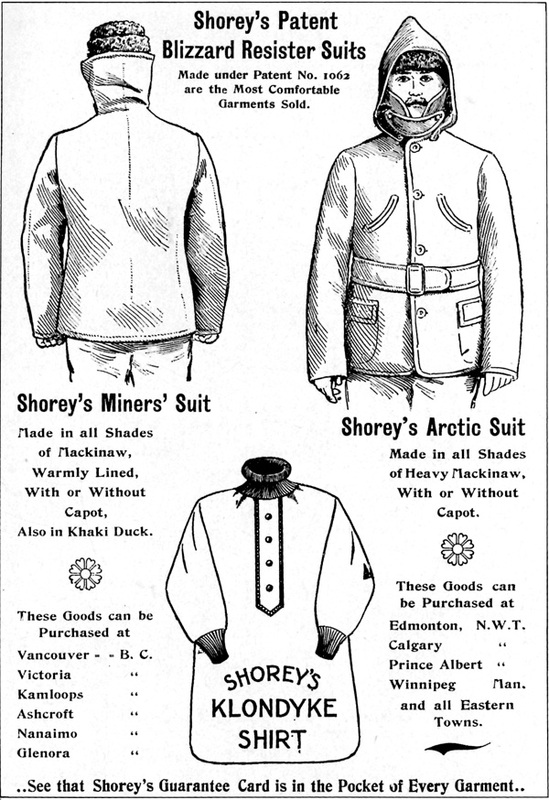 Items "B" and "C" are Shorey's "Patented Blizzard Resister Suits" and item "G" is the Klondike shirt made by the same company (Fig. 11). These articles were still being distributed through Eaton's long after the gold-rush had subsided. Several companies offered everything from robes to parkas, pants, hats and mittens in fur. Few goldseekers, however, could afford fur robes and, because of the greater freedom of movement afforded by fabric clothing, the native skins (as they were called in the Yukon) were more attractive to those not actively engaged in mining.26 Instead of fur robes, most buyers would be satisfied with several heavy blankets, available for less than $10, along with an oilcloth cover. 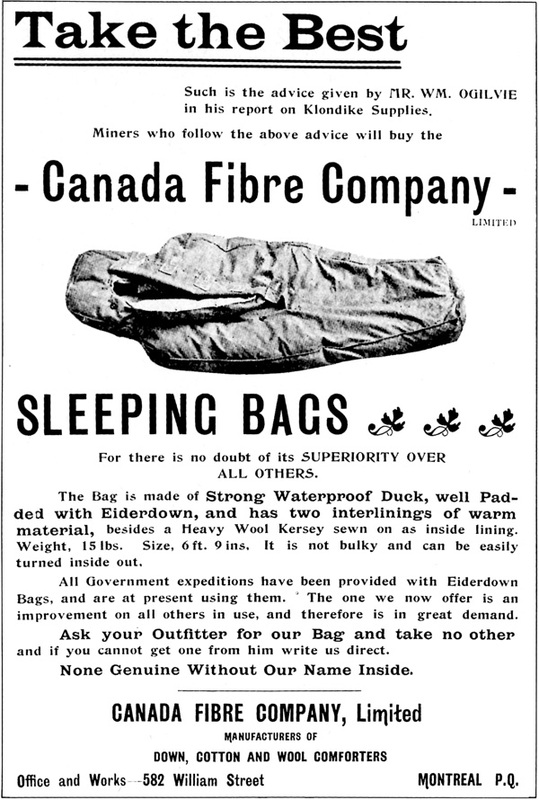 The sleeping bag was gaining popularity, as the Eaton's catalogue shows. Usually of oiled, rubbered or plain cotton, it was lined with eiderdown, fur, wool or felt and cost between $10 and $20 (Fig. 12). As for boots, the miner would have to be outfitted with two distinct types. Winter definitely called for "native boots" or mukluks, which could be purchased in the north.27 For the spring mud along the creeks, rubber boots were essential. Several pairs of snag-proof, unlined hip-waders were advisable. This was one area of the clothing outfit where brand names did emerge. The AC Company stood behind the patented snag-proof and crack-proof "Gold Seal" products of the Goodyear Rubber Company of San Francisco. 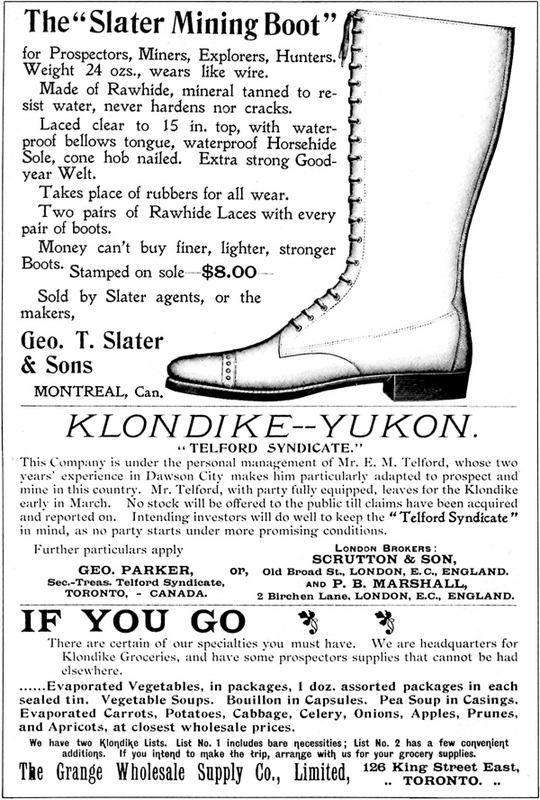 In Vancouver, "English K-boots" ("guaranteed absolutely waterproof, snagproof gum boots") were advertised,28 while the Canadian Rubber Company of Montreal offered the "Alaska Mining Boot" (Fig. 13). Waterproof rawhide boots were popular; they were more suitable for the arduous trails than for the final muddy destination. George T. Slater and Sons of Montreal produced a boot for $8 that remained a well-known brand in Dawson (Fig. 14). Completing the clothing outfit were heavy wool socks, called arctic socks or often "German wool socks," underclothing (Jaeger flannel was common), mosquito netting and snow goggles. Depending on the season in which one started north, one of the last two items would be essential to one's travelling comfort. Again, the brand names made popular by the strike remained so in Dawson stores. The hardware list in the outfits sold by McDougall and Secord was much like the one recommended by Ogilvie himself.29 In addition to the tools and utensils which must have been familiar to all woodsmen and explorers, certain items were particularly adapted to the life and survival of the Klondike miner. The gold pan and scales were obvious inclusions, as were pick and shovel. In the hands of a resourceful miner, the pan could be used both as wash basin and bread pan. The problems encountered by the miner who discovered too late that his outfit contained useless quantities of goods have already been mentioned. In the case of an excess of hardware or food, the packs were either jettisoned or traded off, depending on the relative demand for the product.35 In this way booths stocked with the leavings of disheartened goldseekers became a familiar feature along the Trail of '98. For those who ran them, this was often the first step to a lifetime's work of merchandizing in the north. The sudden demand for nearly a ton of supplies for each of tens of thousands of adventurers was an unexpected shot in the arm for the food supply industry across the continent. The news of the Klondike gold finds which had arrived in July of 1897 with the first nugget-laden ships, Excelsior and Portland, must have excited astute wholesale dealers along the steamship routes. It opened the possibility not only of profiting from the outfitting trade, but of eventually earning a share of the market at the gold fields for as long as the capricious paystreak would support one. Also experienced, but in a less favourable location, were the northwest centres of Edmonton, Calgary and Prince Albert. Undaunted, these towns publicized the overland route (via the Mackenzie watershed).41 While Edmonton merchants did indeed manage to profit from the gold-rush,42 they could hardly continue shipping goods along the impossible and tortuous wilderness route which they had once urged the goldseekers to follow. One significant feature of Seattle's successful outfitting business was the organizaton that pervaded the trade early in the game. The descriptive article which follows appeared in the Toronto Globe in February 1898. As in Seattle, it was the wholesale dealer in Canadian centres who was most prepared to outfit. As the Globe article quoted above indicates, however, trade in Victoria and Vancouver was handled to a larger degree by specialists. 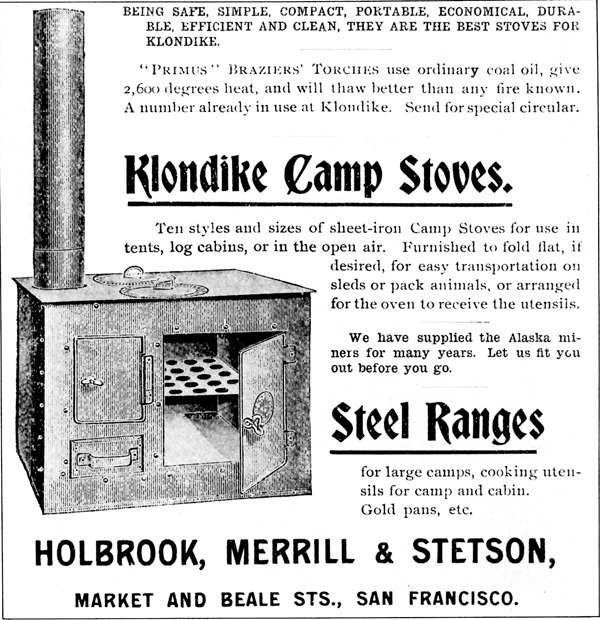 In Vancouver, for instance, there were over twice as many wholesale grocers as either hardware or dry goods firms advertising in the "Holiday Klondike Edition." Lugrin's Yukon Gold Fields shows a preponderance of clothing merchants in Victoria. In tools and hardware, the name McLennan, McFeely and Company is irrevocably attached to any reference to Vancouver's role in the gold-rush. Bypassed by Klondike-bound steamers from both Seattle and Victoria,53 Vancouver had a poor position in the opening lineup. Not until the new year, when two CPR steamers were transferred to the Vancouver-Skagway run, were Vancouver's inadequate shipping facilities increased to the point where it could compete as a point of departure.54 Consequently, the reaction of Vancouver's business sector to the rush past its door was a belated one. Sporadic Klondike advertising in the Vancouver Daily World was not replaced by impressive and consistent daily copy until after the "Holiday Klondike Edition" came out on 31 December 1897. Once fully mobilized, however, the Vancouver outfitting trade reached its peak between February and June 1898. The initial outfitting rush was short-lived; it lasted only until the end of the 1898 season.58 By the fall of that year, Vancouver and Victoria merchants alike were plagued by overstocked shelves.59 The battle between Seattle and Vancouver continued, but from then on it was to be fought over the long-term privilege of supplying Dawson retailers. While Victoria had originally seemed the most likely rival to the American port, her position was in fact taken over by Vancouver. Once the two cities' shipping was equalized, Vancouver's rail connections with the east earned her a more advantageous position from which to deal with incoming goods and goldseekers. One very significant outcome of the outfitting rush was the keen and continuing interest in the Yukon trade which was generated by the outfitting experience of several Vancouver merchants. 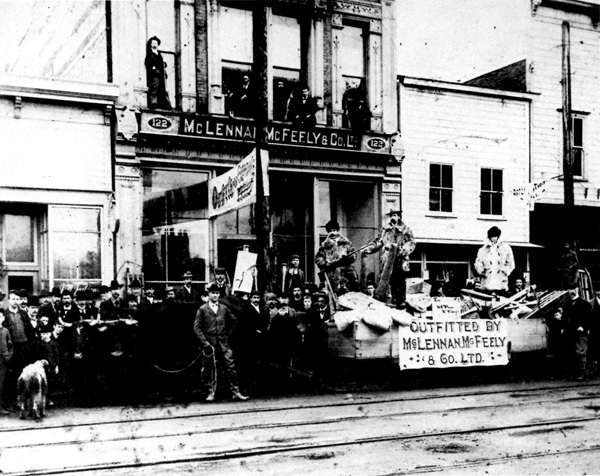 The Oppenheimer Brothers, commission merchants, importers and wholesale dealers in groceries, provisions, cigars, tobaccos and so forth, were leading participants in the Vancouver Board of Trade's campaign to wrest the Yukon trade monopoly from Seattle.60 McLennan, McFeely and Company lost no time in establishing one of the earliest hardware and tinsmithing businesses in Dawson61 (Figs. 16 and 17). McLennan himself moved north to manage the outlet, becoming Dawson's mayor in 1903. Thomas Dunn and Company, another wholesale hardware firm, made a long-lasting contact as one of the largest single suppliers of the Dawson Hardware Company. Kelly Douglas (in wholesale grocery supplies) remains to this day as familiar a name in the Yukon merchant's vocabulary as "Mc & Mc." Calgary, Edmonton and Prince Albert were all recognized as experienced outfitting centres,62 and enjoyed in addition the reputation of being the gates to the only all-Canadian route to the Klondike. Despite the rigours of the long overland haul along the Athabasca and Mackenzie rivers, it was a much-promoted route. Not the least enthusiastic of its promoters were the Toronto and Montreal suppliers who stood to profit directly from extensive outfitting in the northwest.63 To the disappointment of all business interests concerned, the all-Canadian route never became a major shipping route to the Yukon. While at first glance it seems that the spoils of the Klondike rush went to Pacific coast merchants, Montreal and Toronto enjoyed a steady growth in the areas of importing, processing, manufacturing and distribution which permanently expanded their lucrative western market. 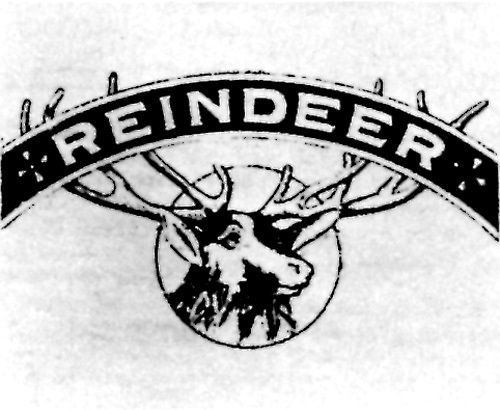 It is worth noting at this point that the Toronto Board of Trade believed itself to have been influential in securing bonding privileges in Alaska more suitable to the entry of greater volumes of Canadian products.66 While the names of Seattle and Vancouver distributors became bywords to the thousands of Klondikers they supplied, eastern manufacturers immediately understood the potential profit in establishing their brands in the north through these agents. 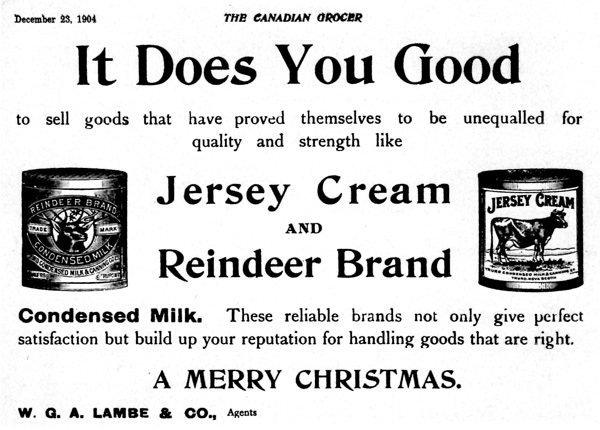 Importers, especially those in Montreal, gained the agency for several Klondike-bound British products. Bovril, Vimbo's Fluid Beef and E. Lozenby and Son's soup squares were all British products sold through such Montreal dealers as A.P. Tippet and Company of Montreal and Toronto.74 One unnamed German manufacturer was allegedly doing well on the west coast and among eastern wholesalers, selling a product which had known 15 years of consistently slack markets.75 Demand for his line of assorted evaporated vegetables reached dizzying proportions, thanks to the Klondike. The commercial link between Ontario food packers and British Columbia outfitters was firmly maintained throughout the gold-rush and beyond by a relatively small and secure group of food wholesalers that jobbed (that is, distributed) the manufacturers' goods among western retailers. W.H. Seyler and Company, Eby, Blain and Company, Warren Brothers, and Davidson and Hays, all of Toronto, furthered their reputations as reliable distributors and thereby profited greatly, albeit indirectly, from the great discovery of 1896. As the rush of individual goldseekers over the passes was a phenomenon of the winter and spring of 1898, the frenetic attempt to provide necessities to these men faded when their goal was reached. During the summer of 1898, once the mass of goldseekers had reached Dawson, a new supply system took over. The simplest statement that one can make about the fascinating mercantile mosaic of that summer is that trade was largely a matter of reselling the tens of thousands of tons of goods which arrived at the waterfront. This activity resulted in acute shortages in certain areas, exorbitant prices and uncertain quality of goods. These elements of unpredictability made for a chaotic, if picturesque, throng of companies, storekeepers, jobbers, pedlars and simple dealers. As the shipping season closed, after the faint-hearted had sold out their outfits and gone home, it became clear that "starvation" winters, at least, were a thing of the past. Since few would venture into the Yukon valley before the next spring, the outfitting trade suffered a predictable slump. As such, the end of the 1898 shipping season marks a point of transition. 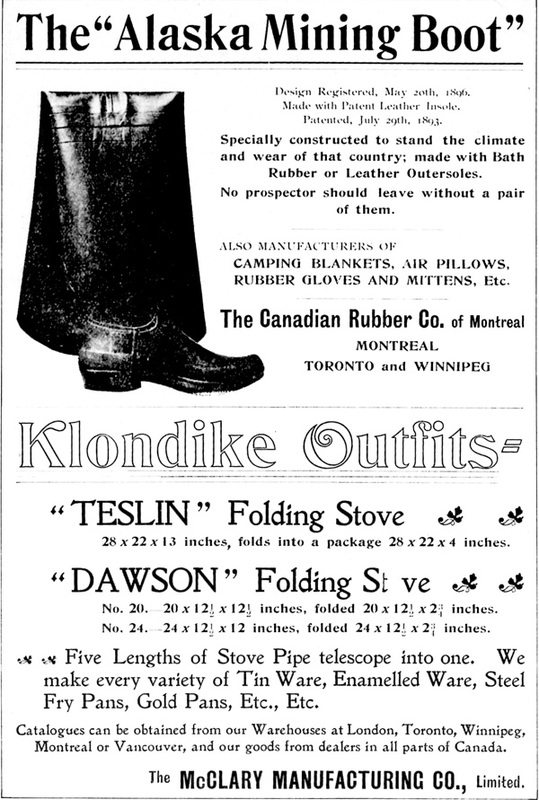 For many outfitters, contact with the wealth of the Klondike would be limited to the early enthusiasms of 1897-98. For the larger, more experienced and more persistent companies, the initial rush would turn out to be more than a flash in the pan. Klondike gold was indeed going to hold out, and since their foundations had been successfully laid in the previous year or before, these companies would be the ones to reap the benefits of the new trade patterns by becoming steady wholesale suppliers to the Dawson merchants. To extend their bonanza, they had only to come to grips with the combined problems of distance, terrain and climate in order to supply the motley Dawson market with whatever it wanted  for as long as gold held out.